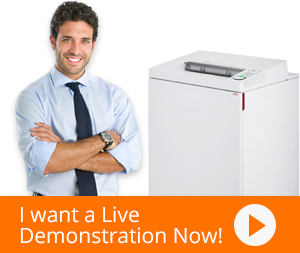 HSM Shredders yet again outclasses its competitors by introducing the NEW PURE paper shredder series. The HSM Pure 420s Strip-cut shredder is one of the sturdiest German engineered machines in the industry that has hardened steel cutting rollers with lifetime warranty. With a level 2 security, the HSM2341 Pure 420s shredder shreds strips into ¼” particles at a speed of 12.8 ft./min. Designed personal/small office usage, 1-6 users can use this shredder and shred up to 24 sheets through a 9.5’ throat width. HSM Pure 420s shredder has the ability to shred paper as well as Staples, Paper Clips, Credit/Store Cards and CD’s/DVD’s. Along with this, Pure 420s shredders powerful motor ensures continuous operation and the quiet shredding feature minimizes noise in the workplace throughout. This intuitive shredder is engineered ground up for professional outputs. The HSM 420s comes with a built-in 9.2-gallon spacious waste bin that can effortlessly be removed and emptied. HSM ensures to deliver high quality products, promising durability. An epitome of excellence, the HSM 420s Strip-cut shredder is certainly best suited for official use.